Taking a cue from Red Queen’s advice to Alice, technology and the people powering technology seem to be running twice as fast as they can with an intention of getting to someplace new. With 2012 coming to a close, everyone is busy making their predictions and giving the quintessential finishing touches to their 2013 wish-list and why not? 2012 managed to give us a taste of what to expect from 2013. The year 2012, with much groundbreaking advancement in technology changed the way we interacted with each other. It brought mobile technology within the reach of the masses. We saw great innovative products, bitter one-upmanship wars, clever marketing strategies and unfathomably new technologies. While some companies had roaring success with their products, the others received an icy-cold response from the consumers. Nevertheless, with what we have seen in 2012, we can only assume that the next year will be equally great, if not better. 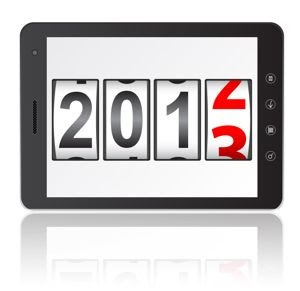 Here is a list of our Top Six Predictions for Information Technology Trends in 2013. With the advent of smartphones and the concept of multi-touch, the world of mobile communications changed forever. Communications and computing underwent a drastic change with the launch of the iPhone and the iPad. Developers around the world were seen jostling against each other to develop the perfect mobile device that can bring the best of smartphones and tablets in to one great product. Thus, the idea of creating a product that will act as a bridge between smartphones and tablets came about - the Phablet. The Phablet acts both as a tablet and as a smartphone but with a larger screen and lesser price. Phablet’s growing popularity shows that the future for it is certainly good. With Apple and Google showing keen interest in developing phablets, 2013 may see them taking over consumer markets. There are times when you have been typing the whole day and come to a point where you can’t type any more. A voice assistant who can type what you say would be a welcome idea if it can save you from spending innumerable hours typing. Yes, this was the idea behind Siri. But, Siri has a long way to go. And in 2013, we may see a lot more of a refined Siri and Siri-like voice assistants. Apple is making Siri more equipped to handle voice commands, interpret human speech nuances and recall previous commands and results. Siri has been a great start but 2013 may bring in many more Siri’s for everyone. NFC technology, predicted by experts as the future of smartphones never seemed to catch fire. But with Apple’s iPhone 5 bringing NFC tech to consumers, analysts predict NFC to be the future of data transfer. NFC has been implemented in most Android smartphones too. NFC technology enables wireless transactions between mobile devices. The need for data cards is completely negated when NFC is used for data transfers and commercial transactions. By pairing devices close to each other and tapping on products, files or data will get transferred from one phone to the other. The Sixth Sense Technology has been around for quite some time now but it really hasn’t been exploited much. That may well change in 2013. The ability to read information from the Internet and project it on to a wall and using gestures for manipulating daily activities can be fantastic. To better understand the concept of Sixth Sense Technology, imagine taking pictures using simple hand gestures. We are hoping that the year 2013 will see sixth sense technology materializing. We have seen chiclet keyboards, the TypeCover and the TouchCovers and thought that keyboards can’t get any savvier. But, with infrared keyboards and holographic keyboards on the offing, we may be compelled to change our views. They certainly look unrealistic and unlikely but hasn’t every new technology started on the same road? With Apple filing a patent on the design for projectors similar to Pico, the idea behind virtual keyboards will have a shot at reality. Everyone these days, seem to be on cloud nine. The future of mobile technology will rely on cloud computing. Hybrid clouds and personal clouds will become common terms in the field of computing. Cloud Computing will harmonize and increase the use of all mobile devices from smartphones to tablets. While the last few years have paved the way for today’s mobile technology, the smartphones and tablets of today will certainly shape the future. With everyone turning into modern-age Nostradamus predicting the direction in which information technology is going to go, the future of mobile technology is anything but mundane. We have listed a few predictions and trends for 2013, but the best thing about future, as they say, is that it has begun already. The future is here. Are we ready to greet it?